Interfolio's Dossier offers tools to help scholars manage their career and apply to academic opportunities. From applying to schools, to apply for tenure reviews, we can help you collect, organize, and send out evidence of your academic excellence! With free Dossier account, you can request and store confidential letters of recommendation and upload and manage the materials you will need throughout your academic career. Your Dossier account never expires, and your uploaded materials will always be available to you at any time. Applying to Interfolio-hosted positions is free, and these deliveries do not count against your 50 annual deliveries. With a $48 annual subscription to our Dossier Deliver service, you can send your materials when applying for jobs, fellowships, and other academic opportunities. An annual subscription includes 50 deliveries by email, mail, or confidential letter uploads to online application systems. We will also perform quality checks on your letters of recommendation and alert you and your letter writer if our team finds a problem. 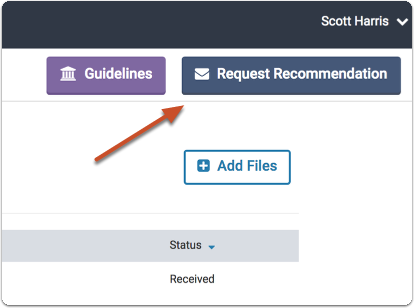 Institutions who offer their users Dossier accounts through Dossier Institution, then those users have the ability to use guidelines as well as the ability to share their materials with other users at their institution. Follow the instructions below to get up and running quickly. 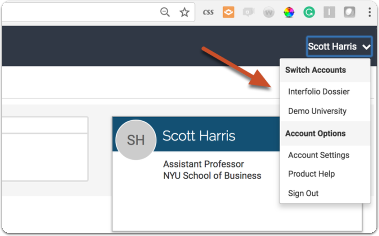 If you have Dossier through your institution, after logging in to the program, you may need to click your name at the top right of the screen and click "Interfolio Dossier" to switch to your personal Dossier account as shown below. You can upload files from your computer, link to YouTube and Vimeo videos, or include links to webpages in your Dossier materials. 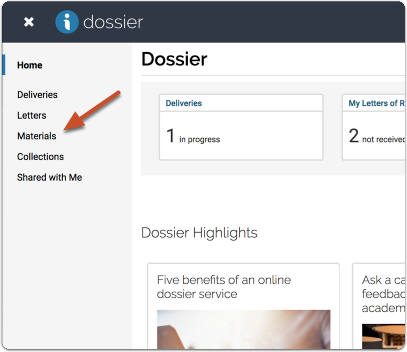 See here for more information on adding materials to your Dossier. We will send a request for a confidential recommendation to your letter writer. When your letters come in, they will be stored with your Dossier materials, and you can send them where they need to go, all while maintaining complete confidentiality. Simply click "Request Recommendation" in the upper right corner of your "My Materials" page, and you will be walked through the process. See here for more information on requesting letters of recommendation using your Interfolio account. 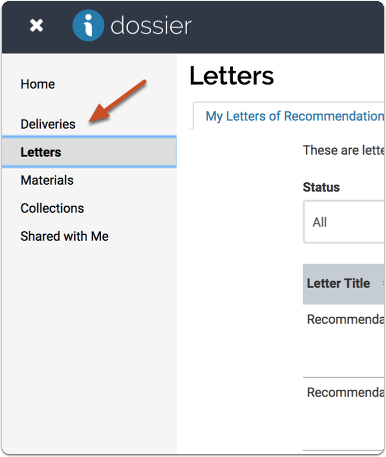 Here you can view details about your requested letters, check the status of your request, and re-send requests. You can also view letters you have been asked to write by other Interfolio users. See here for more on how to build and manage your Dossier. See here for more on the quality check process. Once you have assembled your materials, you can create collections of related materials to organize your Dossier. You can use collections to gather materials for any specific purpose, such as a collection of materials for a job application, or collections to be used for particular types of positions such as fellowships etc. See here for more information on adding collections. This premium feature is only available to users with Dossier Deliver accounts or users with Dossier Institution accounts. See here for more information on sending application materials. See here for more information on applying for a job or fellowship hosted by Interfolio. See here for more information on using Interfolio to search for employment and fellowship Opportunities. When searching for opportunities listed through us, you can also opt to trigger a search for your terms on Inside Higher Ed, HigherEd Jobs, and HERC (Higher Education Recruitment Consortium). 9. When you find an opportunity that interests you, either an Interfolio-hosted position, or a position listed on another listing service, use the materials in your Dossier to apply!